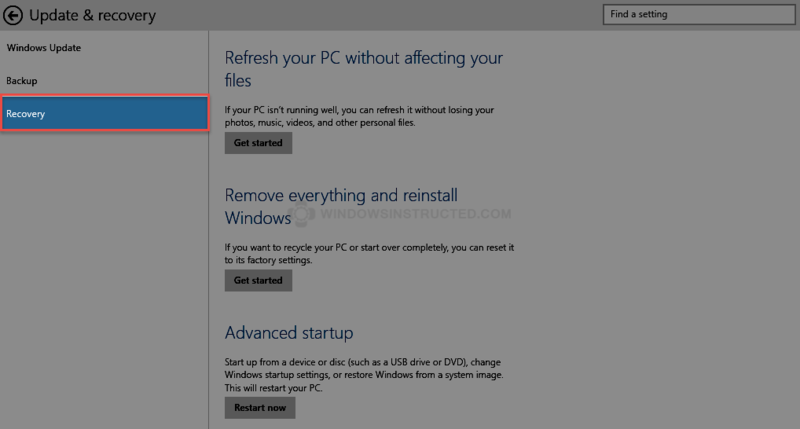 Windows 10 has by default the same options available as Windows 8, so if you were used to Windows 8 recovery options then these options will not surprise you. You have the following options available when choosing to reinstall Windows 10. Remove everything and reinstall Windows 10. The options are actually quite self explanatory. But I will spend a couple of seconds explaining them just so you are sure. This option will keep all your files and Windows Store Apps, however will remove all installed applications from discs and websites. All computer settings will be restored to their default settings and Windows will save a list of all removed Desktop Applications. I know it’s a lot of text, but please do read all the Good To Know bullets. They are there for a reason! Windows will try to keep all the files if you choose “Refresh your system without affecting your files”. However I strongly suggest you to make a back-up to avoid nasty surprises if something goes wrong, also be sure to write all Product Keys. If you reinstall because of a Malware infection then Refresh your System Without Affecting your Files is not the option you should choose, there is a big chance, I dare to say 99% chance that the Malware will be there after the Refresh your System option. If you choose to Remove Everything and Reinstall Windows 10 because of a Malware infection and you have multiple partitions then make sure the partitions are clean of Malware and that the malware is only on the System Drive. Otherwise the malware will be back quicker then Windows can say “Welcome” at the first boot. You can now choose which option you want. Click on Get Started and the Wizard will start, read the instructions carefully and follow the Wizard. If you choose to do a Refresh and the problems still persist then the only option you have is to remove everything and reinstall Windows. If you need help or advice then please do comment, I will try to help you in the comments. Since installing windows 10 I have lost two of my older programs. I have tried reinstalling these programs, but the program is missing important parts. These programs are to draw and create cards and other art work I use for my own business purposes. I tried to return to Windows 7, but the transition never occurred. I would like to use 10, but if I can’t use my older programs, I’d rather return to 7. Please help me one way or the other. I had upgraded to windows 10 last week . This week something happened to my system and its not showing the settings app / start menu/ Windows Store or other windows 10 apps. Edge browser is also not there. So I tried to reinstall windows 10 from the DVD image I had downloaded . I mounted the image to drive . It then asked to me the product key for windows 10. I don’t have a product key for win 10 or the OEM Win8 I was having. I don’t have the Key anywhere for win 8 ,just I got the windows in activated form. Do you need a Windows 10 Product Key for a Reinstall? I thought Microsoft was sending me one, but I do not have any records of that. Should I just use my old Windows 8 Product Key?